Some sports lend themselves very naturally to psychology. These are the games where there is plenty of time to think. One of them is snooker. A simple miss and you can be back in your chair, whilst your unforgiving opponent hoovers up your points. And if your mindset isn’t right, that miss can prey on your mind, building up the doubts. Before you know it, you have talked yourself out of form! When your on your A game, it can feel like you are going to pot every ball. The line from object ball to pocket is lit up like Blackpool Illuminations. Your cue feels like a wand. The cue ball is dancing to your tune. You can see five shots ahead, yet are fully in the moment. If only it was like this every day! But what if your not on? What if your cueing is out of sync? What happens when you can barely see the line from ball to pocket…which itself looks smaller and smaller with each visit? What about if you are a quick player, and your opponent is just the opposite of you…slow…deliberate..each time they look at a shot, you can feel your impatience building…and of course the more frustrated you get…and the harder you try…the more out of rhythm you feel! Maybe you are super-talented around the practise table…knocking in tons with the minimum of fuss. But the moment you enter a tournament you lose that practise room groove and fluency, and wonder where your game has gone! Perhaps you are in a back room in a Tour Event…unpredictable table…poor lighting,,,no atmosphere…you just can’t get motivated…and subsequently you are on the next plane home, having lost to a player who you know you have more talent than. Or maybe you are on the Tour, and you have not been securing the prizes. Suddenly you find yourself needing to win a final frame to secure a win against a top player. And instead of staying in the moment, you start thinking about the consequences of winning. Suddenly, despite looking set to win with 50 points on the board, you break down on the blue, and your opponent is in. Sound familiar? Maybe you come off the practise table in a nice rhythmic groove. Then once the match starts you just cant find your game. And you have no idea why. Leading to frustration and doubt. Being able to understand how to fix your game is a key tool for a good player. It means having simple strategies that you can turn too when things aren’t working, to get you back in the groove. Jimmy Robertson turned professional in 2002. A naturally talented snooker player, who had never managed to translate his talent into trophies. Jimmy contacted me in 2017 keen to turn things around. As we began work, signs of improvement were steady. A first ever ranking event quarter final. Successive qualifications for the World Championships at the Crucible. Then in October 2018. the breakthrough occurred. Jimmy securing his first ever ranking title, beating Joe Perry 9-6, to win the European Masters in Belgium. Closing out the match in style with a masterful century break. For the first time in his career, Jimmy’s performances matched his talent. Now everything is possible for Jimmy! What would be possible for you, if your performances matched your talent? One player who contacted me looking to translate talent into results, was Ricky Walden. A top player, whose trophy cabinet didn’t reflect his ability. 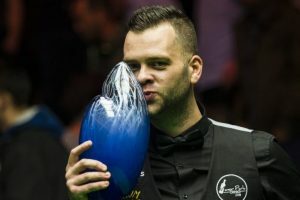 Within four months of working together, Ricky had secured the biggest pay-day of his career, securing the prestigious International Championship. Ricky showed great mental strength, as he closed out the final three frames to see off Mark Allen. What could achieve if your mental strength matched your talent? My snooker psychology is designed to help you get your game back on track. You may have thought of calling someone like me before. But maybe you weren’t sure what was involved. Or even if it would work? If you have never experienced the power of snooker psychology before, then I would like to offer you the chance of working with me. The first step is to arrange an initial meeting or phone call. In this call, I will show you how to take your game to another level. If you want to head to the 2016 – 17 season with renewed confidence, then this is the time to act. You know better than I do, that a positive start to the season can set up you up for the whole of the next campaign. So – here’s the chance to get your career moving forward immediately. Option 2: Or fill in the form below, then send it to me using the ‘Start Coaching’ button at the end of the form. You will then receive an invitation from me, via email or phone, to arrange a time to speak. Remember – you could wait and hope that by magic, your confidence returns. But experience tells me that rarely happens. There is a reason why you have lost your confidence. The sooner we get started, the faster you will be back to your confident best. What is the area of your game that you would like to have more confidence in?